You can “Stand Out” with a small stand. You don’t have to spend a lot of money to achieve a great looking upgrade stand; you just need a stand design that is innovative and clever. 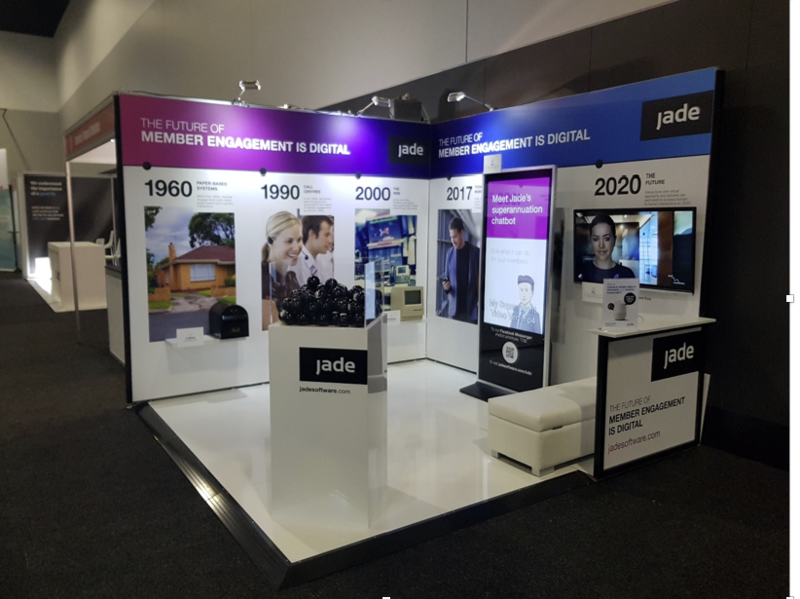 For example, take this recent design we built for Jadeworld at ASFA. Listening to our client’s brief, we came up with the following solutions to transform what would under normal circumstances be a traditional and uninspiring 3 x 3 corner booth and transformed it into something that was eye catching and demanded attention. To help the client achieve the feeling of openness we removed the fascia, added floating shelves, wall mounted the TV (rather than using a bulky TV stand) and selected furniture that also doubled as storage. By keeping the stand open, bright (fresh black powder coated extrusion), high gloss white raised floor and once again removing the fascia sign we were able to also meet the clients desire for the stand to be ‘inviting’ for potential customers. We addressed the need to incorporate IT into the design by adding a touch screen feature and a wall mounted TV. Finally, to provide a concept that was more than ‘just signage’ we made the walls (& fabric banners) pop by adding 3D elements which were supported by floating shelves. Other elements such as the return wall that was cleverly turned into a counter, and the fabricated high gloss plinth helped to add interest and depth to the stand. By listening to and truly understanding our client’s needs we were able to add (and in some cases remove) a few simple elements, with the end-result being an ‘outstanding’ display that was unique, innovative and created attention for our client’s brand.